Good breakfast, nice pool, able to eat true Singaporean food myself. The pool is nice to chill out, there is a supermarket in the same building. Breakfast was not of our choice what we Indian Like. love yhe view from my room, 463. I got pool view. The breakfast was quite good. The staff were really friendly. Loved the variety of cultural food in the breakfast buffet. 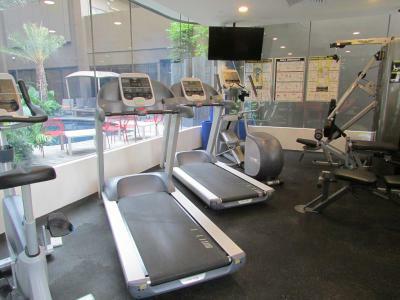 Ibis Styles Singapore On Macpherson This rating is a reflection of how the property compares to the industry standard when it comes to price, facilities and services available. It's based on a self-evaluation by the property. Use this rating to help choose your stay! 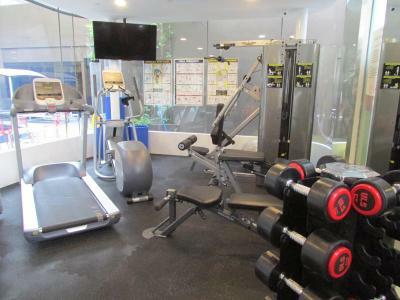 Situated within 1.2 miles of Paya Lebar Square and 1.4 miles of Tanjong Katong Complex, Ibis Styles Singapore On Macpherson in Singapore features a fitness center and rooms with free WiFi. The property is located 1.5 miles from City Plaza and 1.5 miles from One KM Mall. 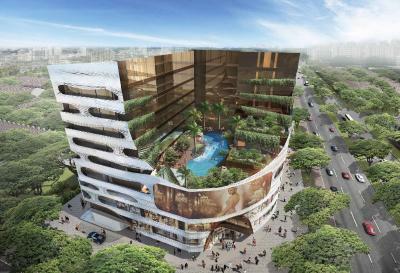 The property comes with an outdoor pool and is set 1.6 miles from Geylang Serai Market. The rooms in the hotel are fitted with a kettle. Each room includes air conditioning and a flat-screen TV, and some rooms at Ibis Styles Singapore On Macpherson have pool view. A continental breakfast is available each morning at the property. There is an on-site restaurant, which serves a variety of Mexican, seafood and local dishes. 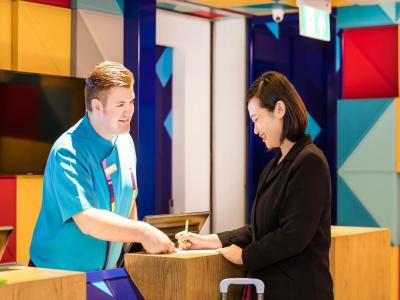 Speaking English, Hindi, Indonesian and Japanese at the 24-hour front desk, staff are always on hand to help. ICA - Immigration & Checkpoints Authority of Singapore is 2.1 miles from the accommodation, while Mustafa Centre is 32.2 miles away. 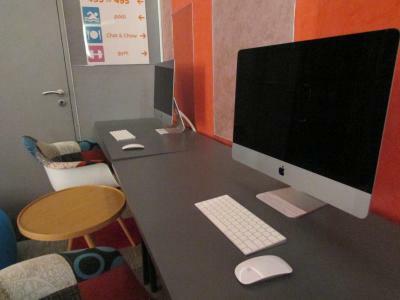 When would you like to stay at Ibis Styles Singapore On Macpherson? This bright and colorful room features a Queen-sized bed, a mini fridge, in-room safe, LED TV and tea/coffee making facilities. Room can accommodate 2 adults and 1 child. Public parking is available on site (reservation is not needed) and costs SGD 1.20 per hour. 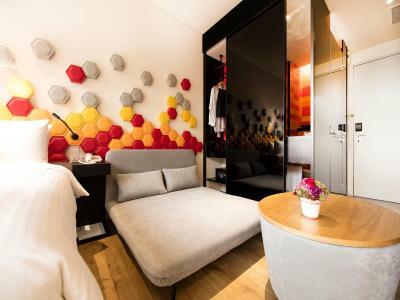 This fun and funky room features 2 single beds, a mini fridge, in-room safe, LED TV and tea/coffee making facilities. Room can accommodate 2 adults. This triple room features 2 single beds and 1 pull-out bed. The room provides a mini fridge, in-room safe, LED TV and tea/coffee making facilities. Room can accommodate 2 adults and 1 child or 3 children. This modern room features a single bed, a mini fridge, in-room safe, LED TV and tea/coffee making facilities. Room can accommodate 1 adult only. This double room has a flat-screen TV, air conditioning and washing machine. This double room features a flat-screen TV, washing machine and air conditioning. 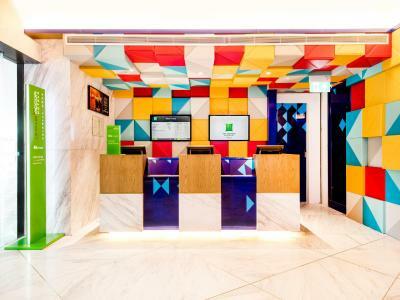 House Rules Ibis Styles Singapore On Macpherson takes special requests – add in the next step! Ibis Styles Singapore On Macpherson accepts these cards and reserves the right to temporarily hold an amount prior to arrival. When we booked our room online, it wasn't clear that the bathroom was in the same room as the beds. This was disappointing as there was little privacy in the room. There were also very little space for your clothes and luggage. Luckily, we only booked for 5 nights. If we were staying any longer than that I think we would of needed to ask if it would have been possible to change rooms. The shopping centre had one supermarket and 2 restaurants. This was also very disappointing as the pictures showed a well presented shopping centre with plenty of shops inside however; this was not the case when we arrived. The staff at the hotel were very friendly and polite throughout our stay at the hotel. The hotel restaurant served lovely food and it was well presented. The rooms are quite cramped, the bathroom was quite sad . The breakfast also was okay dokay .first 2 floors are advertised as a mall but most of the place is empty , the only positive is that they have supermarket on the second floor . The pool was by far the ok one . I asked to put up a towel deco for my mum bday but didnt do till the end till i myself cancelled not to do. No brushes and toothpaste. Breakfast not enough. No tea. Staff kept me waiting too long. Bakery shops are open but no people to make order. Aircon cant adjust. Additional breakfast payment tooo expensive. The pool area is smaller than what it looks in the pictures. The restaurant is small for the amount of people they receive. We requested for a taxi, the receptionist was helpful but wasn't able to anticipate that we need a bigger size of taxi for 4 of us, he booked twice because of that and we have to wait longer for that. Breakfast was really full of variety. We enjoyed it. The room was relatively small. No drawers to put things in, so basically lived out of our suitcases. Original booking was for a room without a window, which was not made apparent at the booking. Upsell, for a window, cost 10 dollars more per day. Pool was relatively small and shallow (1.2 m). Shuttle schedule was very infrequent. Breakfast was a mix of Western and Indian food. Coffee was freshly brewed per cup. Free shuttle to four different areas of Singapore. Wifi reasonably fast. Toilet was separate from shower, but the door did not close properly, so sounds were very audible. The room was quite compact with no privacy. The shower had lack of privacy for a family room and the water did not drain away that well. we were able to access the next room through a door in our room which I think is not really acceptable the rims should be more secure. The staff were very friendly very helpful and they were direct us to where we needed to go or call a taxi and provide good information for us. No late check out available, the location and that breakfast finished early. I was told breakfast was served until 10.00. At 9.57 they were already clearing things away, my mug of tea was practically taken from under my nose (I had to hold on to it), my table was cleaned as if I wasn’t there and the staff were really most unhelpful. The cold milk was warm (they had made no attempt to keep it cool), the cereal was not crispy, the croissants tasted and felt like they were two days old. Check in took about 15 mins from reaching the desk. Food services and shuttle buses were great, also close to the MRT. Staff were very friendly and helpful, was a lovely stay.